Every great chef has a defining recipe -- A signature dish is that recipe that identifies an individual chef. It should be unique and allow an informed gastronome to name the chef. 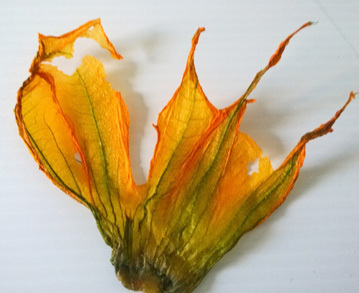 It can be thought of as the culinary equivalent of an artist finding their own style, or an author finding their own voice. 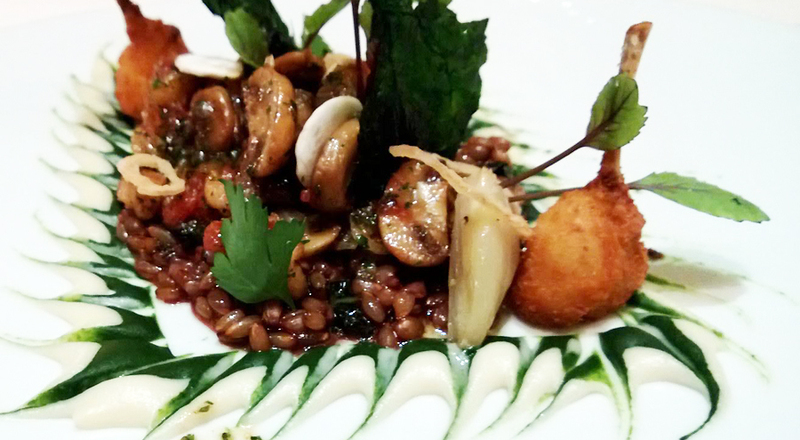 A chef's signature dish often changes with time or they may claim several signature dishes. 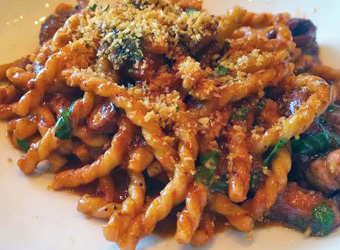 A signature dish can also be used to refer to a culinary region, in which case its meaning may be the equivalent of "national dish". 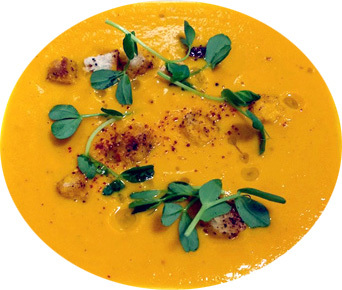 Simple and quick to make, yet very elegant is this Carrot Curry and Ginger Soup with Espelette Croutons and Pea Shoots. 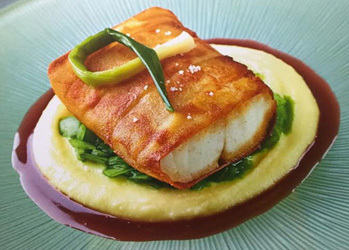 Paupiette of Sea Bass in a Barolo Sauce Daniel Boulud reveals this dish was possible after discovering the Japanese turning slicer. 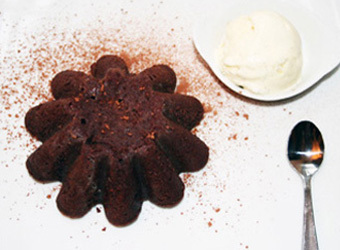 Chocolate Molten Cake - Jean George Jean George stumbled on this dish after taking a chocolate dessert out of the oven too soon..
Fusilli Octopus and Bone Marrow Michael White says this continues to be his most popular dish at Two Star Marea Restaurant. Squid Ink Risotto Helene Darrzone has been hailed as the Best Female Chef in the World She is an Inspirational fourth-generation chef who cooks ingredient-led food with French soul. Pomme Puree Joel Robuchon won his Michelin stars with his famous pommes puree (mashed potatoes)--It is now served at all his restaurants. Robuchon was the first culinary superstar of the post-nouvelle cuisine era. 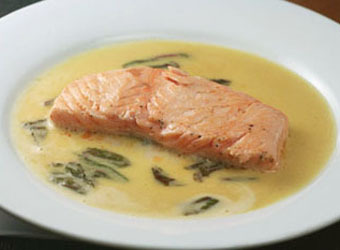 Salmon with Sorrel Sauce Who would think such a simple dish to prepare would become such a star. Troisgros amazed the culinary world when he first served this undercooked salmon. 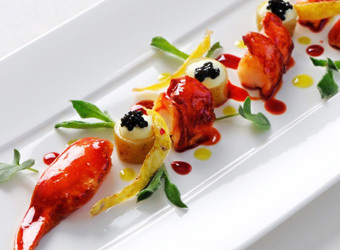 Lobster with Red Pepper Sauce Raymond Blanc brings together the sweetness of Lobster with Red Pepper with the flavors Cardamon Jus in this very special dish. Scallops on Cauliflower Puree Scallops on Cauliflower Puree and Caper and Raisin dressing by Gordon Ramsay is a winner. 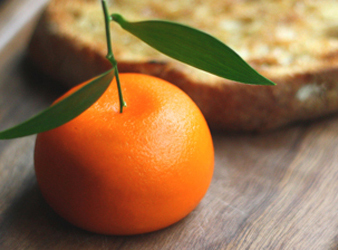 Liver Parfait with Mandarin Jelly---Liver parfait with mandarin jelly by Heston Blumenthal also know as "Meat Fruit"
Coq Au Vin was made famous by Julia Child, braised stews with wine existed undocumented for over a hundred years. 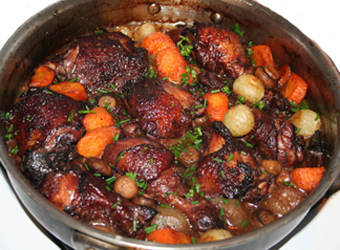 While the wine used is typically Burgundy, many regions of France have variants of coq au vin using the local wine, such as coq au vin jaune (Jura), coq au Riesling (Alsace). 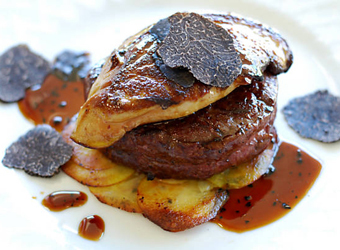 This dish is believed to have been created for the composer Gioachino Rossini in the 17th century comprises a beef filet mignon cooked in butter, served on a crouton, and topped with a hot slice of fresh whole foie gras. The sauce is madeira based. 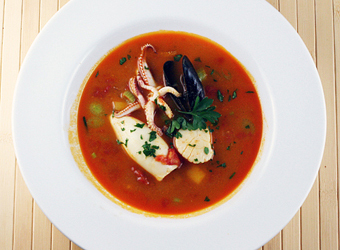 Bouillabaisse is a traditional Provençal fish stew originating from the port city of Marseille. American versions work well using Robin Fish for the stock. 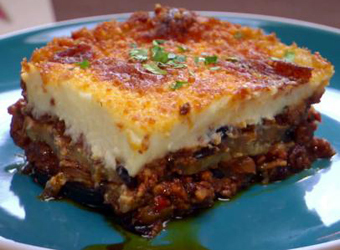 Moussaka is one of the most popular dishes in Greece and found on menus of most Greek Restaurants around the world. 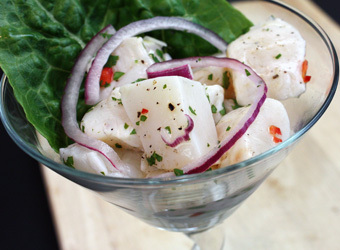 Ceviche is one of the easiest dishes to make. The main ingredient is very fresh fish. 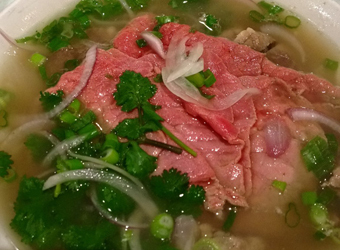 Pho is a Vietnamese noodle soup consisting of broth, linguine-shaped rice noodles,, a few herbs, and meat, usually oxtail. This is a listing of Best Restaurants in the US using data from the Zagat and the Gayot Rating Systems. Zagat's ratings are compiled from people who rate restaurants they have visited. 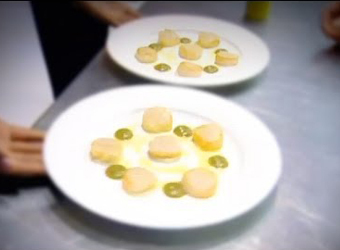 Gayot uses a method similar to the Michelin Guide where a worldwide team of professionals rate restaurants. 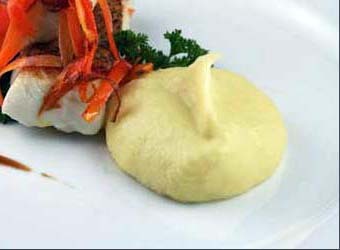 Zagat has a maximum of score of 29, while the Gayot system based on Gault Millau has a maximum scale of 19. See the list.